The most spectacular boat cruises on Lake Geneva are from Lausanne or Vevey with the Lavaux vineyards and Alps as background. The pleasure boat cruises on Lac Léman with the best scenery and most spectacular backdrops are on the upper parts of the lake between Lausanne and the Montreux area. CGN lake boat cruises depart frequently from Lausanne-Ouchy, Vevey, and Montreux for excursions on the most beautiful part of Lake Geneva. One-hour cruises from Lausanne to Vevey pass by the UNESCO World Cultural Heritage listed vineyards of the Lavaux. 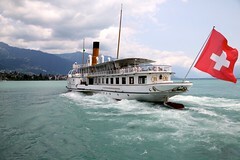 Two-hour circular cruises from Vevey take in views of the Alps while passing Montreux and Chateau de Chillon. 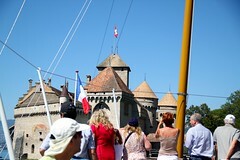 Day-trip pleasure boat excursions on Lake Geneva are very popular. CGN has various cruises and ferryboat services that operate year round on Lac Léman. However, the best boat cruise on Lake Geneva is from Lausanne past the vineyards of the Lavaux to Vevey, Montreux, and the Chateau de Chillon area. CGN has several cruises in this area. 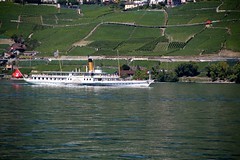 Although passengers generally simply buy a ticket from say Lausanne to Montreux, the cruises are often advertised with more illustrious names, e.g. Fabulous Lavaux Vineyards (Lausanne to Vevey) or Splendor of the Alps for cruises between Vevey and Montreux. 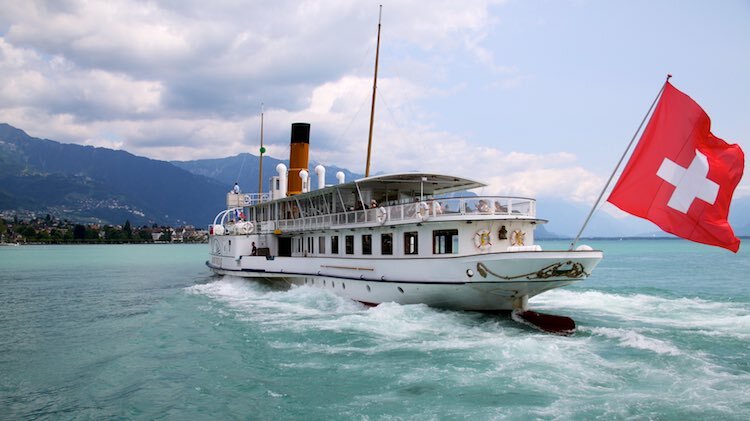 From mid-April to late October, two round-trip cruises (five from late June to early September) are possible daily from Lausanne and a further three from Vevey. In winter, one or two cruises are possible on most Sundays and national vacation days only. Lausanne-St Gingolph direct is 50 minutes while Vevey-St Gingolph direct is just less than 40 minutes. This will make the full round-trip from Lausanne just shy of four hour or two hours when cruising round trip from Vevey. If time is limited, use the trains to return from any stop other than Le Bouveret or St Gingolph – these two towns are on the opposite bank of the Rhone River requiring lengthy detours if traveling by road or rail. If time is pressing try to catch the more frequent trains at Lausanne, Vevey, or Montreux rather than at the smaller stations. Not all boats call at all ports on every cruise and cruises also go in the opposite direction. Cruising on Lake Geneva is not cheap but bear in mind that all other Swiss transportation system and Swiss Railways discounts can be applied, e.g. half-fare cards and the superb Junior Card deal for children. Same-day return tickets are also slightly cheaper than two one-way tickets. See Savings Deals on Lake Geneva Cruise Boats for a range of savings options to make cruising in Lac Léman boats cheaper. Lausanne circular cruise CHF50 (CHF70) for the three-hours circuit, Lausanne-Vevey CHF20 (CHF28), Lausanne-Montreux/Chateau de Chillon CHF26 (CHF37) and Vevey two-hour circuit CHF38 (CHF53). Day-returns are around 15% cheaper than two one-way tickets. The ticket prices (and cruise speeds) are the same for all boats making it worth trying to cruise on one of the very pleasant Belle Époque paddle steamboats. The restaurants – especially the lovely first class salon on the upper deck of the Belle Époque steamers – serve excellent food. Prices are similar to what regular restaurants in Switzerland will charge, i.e. not cheap. Restaurant reservations are recommended but usually not essential. Enquire immediately on the boat if boarding without reservations. If the restaurants are full at meal times, consider coffee and cake once seats become available. Picnicking is allowed on the open decks. 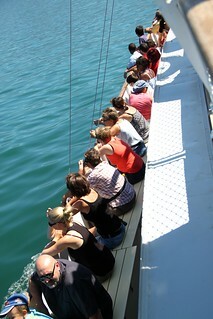 During the shoulder and winter seasons, special dinner cruises usually sail on Friday evenings from Lausanne and Morges. Reservations are essential for these cruises.